Update (under Events > Lifetime): an event unit that fires at every frame. Per Second (under Math > Scalar): a math unit that returns the input value in a framerate-normalized way. 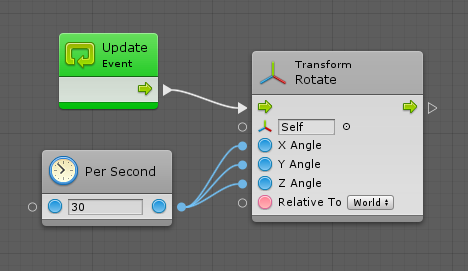 Rotate (under Codebase > Unity Engine > Transform): a method unit that rotates the given transform by the specified angles. For this example, we’ll use the (X, Y, Z, Relative To) overload. If you disabled the dimming from the toolbar in the last article ( ), now would be a good time to re-enable it ( ). Click on the first port, then click on the second port. Click on the first port and hold, then release while over the second port. This graph reads as “at every frame, rotate your own transform in the Y axis at a rate of 30 degrees per second“. A Control Connection between the Update event and the Rotate invocation. A Value Connection between the result of the Per Second node and the Y Angle of the Rotate node. You’ll notice that the nodes become fully visible as soon as they are in use. To delete a connection, right-click on the any of the connected ports. When creating a connection, you’ll notice that the compatible ports are highlighted. Other ports are dimmed out. If a unit has no compatible port, it is dimmed out as well. You cannot create a connection if the target port is not highlighted. For example, here, you cannot connect the result of the math operation (a number) to the target (a transform component), because there is no way to convert between a number and a transform component. Bolt will try to help you aim more easily by automatically selecting the best compatible port on a unit, even if your cursor is not directly over it. This port will be highlighted with a yellow rectangle to let you preview where the connection would happen. This means you can quickly drag the new connection directly on the unit without aiming directly on the little port handle. Control connections are always white, whereas value connections are color-coded based on their type. You can find the color of each type in the Types article. Any type that doesn’t have a color pellet icon will have a green connection. When the toggle is enabled in the toolbar, Bolt will show the last value that traversed this connection during runtime. 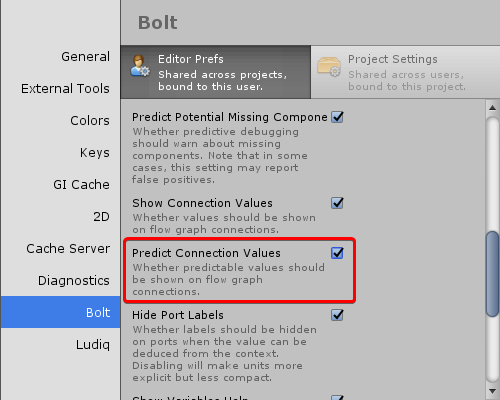 If you enable Editor Preferences > Bolt > Predict Connection Values, it will also try to predict the values before you even enter play mode whenever possible. Bolt can automatically convert many types to keep your graphs tidy. This happens in the background, so you don’t even have to think about it. For example, here, you don’t need to use Get Component between the Transform output and the Animator input, because Bolt will do it automatically. Bolt also supports boxing and unboxing. That means it will allow you to connect any object type port to any other value port. However, it is your responsibility to ensure that the types are compatible, otherwise you will get an error in play mode. A single port can be connected multiple times for convenience. However, you cannot connect multiple value output ports to a single value input port, because then it wouldn’t be clear which value should be used. 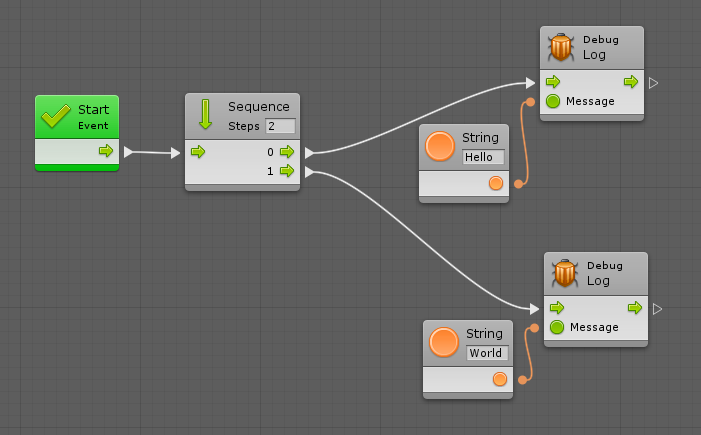 If you want to chain more than two consecutive actions, just use a higher number in the field in the sequence node header. 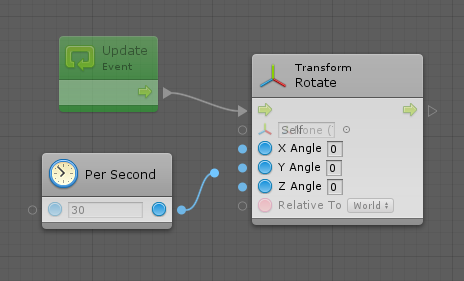 Instead of creating units first then connecting them after, you can start a connection, click on an empty space in the graph, and the fuzzy finder will display new unit options that are compatible with the selected source port. Then, when you choose the new unit, Bolt will automatically connect it to the matching port. Relations are useful to understand what are the dependencies between each port of a unit. For example, in the above Add unit, you can see that if you want to get the result of A + B, you need to provide a value for A and B. Likewise, you can see that before invoking the Log unit, you should provide a value for its Message input port. Relations can also help you figure out which ports are required and which ports are optional. 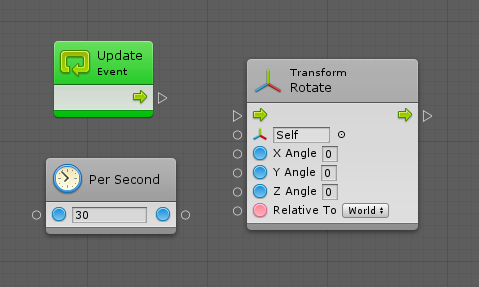 For example, in the Get Child unit (under Codebase > Unity Engine > Transform), we can see that we don’t actually need to connect the control ports if we just want to get the transform value output. Note that you cannot edit relations. They are predefined for each type of unit.